Thank you gifts: are words just not enough anymore? Funny relationship advice for men: make your partner happy! The female always makes the rules. The rules are subject to change at any time without prior notice. 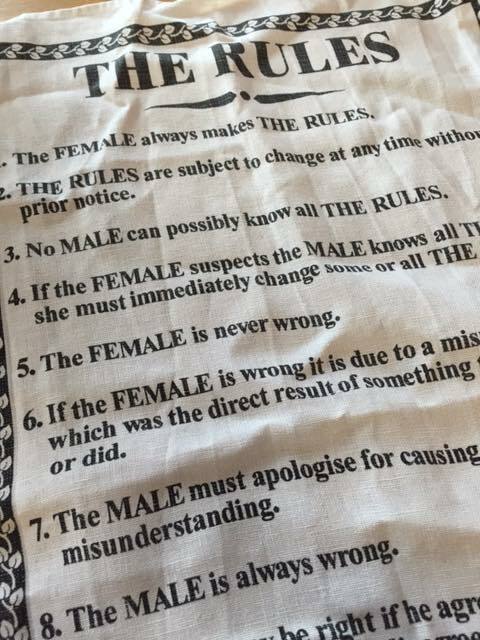 No male can possibly know all the rules. If the female suspects the male knows all the rules she must immediately change some or all the rules. The female is never wrong. If the female is wrong it is due to a misunderstanding which was the direct result of something the male said or did. The male must apologise for causing said misunderstanding. 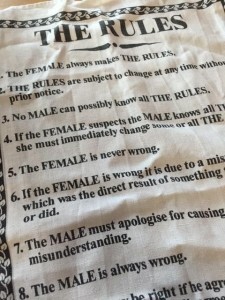 The male is always wrong. The male may be right if he agrees with the female unless she wants him to disagree. The female may change her mind at any time. The male may never change his mind without the express written consent of the female. The female has every right to be angry or upset at any time. The male must remain calm at all times unless the female wants him to be angry and/or upset. The female must under no circumstances let the male know whether she wants him to be angry or upset. The male is expected to mind read at all times. These are, to be fair, very confusing rules! However a clever man will make them work to their advantage! I just haven’t met that clever man yet! Last week, after a few glasses of Oyster Bay, my mum and I could not stop laughing about how men make their lives so much harder than they need to be in so many ways! Whether you are dating, engaged or married. This relationship advice will, I promise, put you in a win-win situation and make your partner happy at the same time! It simply cannot fail. Firstly let’s look at Rule 5, above. 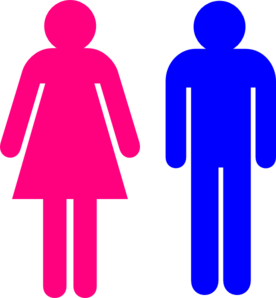 “The female is never wrong.” My husband has recently admitted, albeit begrudgingly, that 99% of the time I am right. He even tells our daughters to do what I say because “mummy is always right.” We have one exception in our house, and that is that I am not right when it comes to the rules of chess. So taking into account that most of the time the woman in your life is going to be right, there is one simple rule to follow. DO WHAT YOUR GIRLFRIEND/FIANCE/WIFE SUGGESTS. You are permitted to say just once “I take your point, I wouldn’t do it that way myself but let’s give your way a go, Darling.” A word of warning though, only utter the above words if you are positive that her way is not going to work, otherwise don’t argue about it, don’t even think about it anymore just do what she says. There are only two possible outcomes that can then occur. Outcome 1: Your partner was right, the task was done quickly and efficiently and she will be happy. Smug, yes (especially if you disagreed at the start) but mainly happy which is a good thing. You will also have earned massive brownie points for not arguing and successfully completing a task! Well done you. Outcome 2: Your partner was wrong. Again a winning situation. If you did state before the task that you disagreed with her method then you may now use the phrase “I TOLD YOU SO!” Crack open a beer and walk around with a smug grin. If you didn’t disagree in the first place then you get to say “HA HA YOU WERE WRONG.” Do a silly dance in her face and walk away laughing to complete the task as you would have done in the first place. You partner will not be very happy but she will not be able to complain. You did as she asked and she was wrong. She should now thank you for trying her way and let you get on with it however you choose. So there you have it. A win-win outcome for all male partners anywhere, in any situation. Nagging is in fact a SELF-INDUCED form of male torture. Like a really bad hangover. Men have complete power over nagging. Let me explain why. Nagging would not exist if men did what their partners asked straight away. The man is in control of The Nag! If you can’t do a task straight away, then give your partner a date and time that the task will be completed by and make sure you do it. If you follow those rules then there will be no need for nagging to occur at all! Good luck men, remember it is within your power to make your life easier and your partner a joy to live with! To conclude I would like to offer you two little stories from a time long ago, before my husband was my husband and before he knew that I was always right. Fourteen years later and he is much better at knowing that I am generally right, however he doesn’t seem to have grasped the nagging rule yet! Share this with all women who want a giggle and all men who need relationship help! I’ve borrowed a quote from Dr. Steve Mariboli as the title of this blog as it pretty much sums up my thoughts on the slanging matches that have occurred in the media since the election. I have so far refrained from blogging about the election results. Of course I voted and therefore have feelings about the result. My husband will tell you that I can be very opinionated, sometimes blindly so. I’m a Capricorn (we can get very feisty), he’s a Libran (irritatingly calm and balanced). I found myself getting really quite worked up about all of the comments flooding Facebook. My reactions were getting quite heated, I’m ashamed to say now, so I had to stop looking at my Facebook page and the news for a few days. I won’t say whether I’m happy or disappointed about the election results because this blog is not about which colour should or shouldn’t have won the election. This blog is about a valuable lesson a friend taught me this week. She has stopped me in my opinionated tracks and changed the way I think and I really hope this blog might do the same for others out there still feeling heated about the election. The aforementioned friend is very passionate about politics. It’s no secret that we voted for completely opposite parties. She knows who I voted for and some of my views and I know hers and we are both quite open about it. Despite our differing views we remain friends and are able to have a laugh about it. Yesterday at school pick up we had an honest chat to reassure each other that we would not be offended by anything the other one said about politics and that we weren’t personally attacking each other. In fact, rather than brushing her views away as ridiculous I actually began to enjoy hearing her ideas and learning from her. I find her thoughts on the subject enlightening. I learn something new from her in every conversation we have. She has really good reasons for why she voted the way she did and I can’t argue with them because I have not lived her life. I’ve have come to realise (and I really wish other people would realise the same thing) that being angry with each other about the way we voted, or which party will run the country for the next five years is futile. Voting isn’t really about choosing a particular person because you believe in everything they are doing. It’s not a war where one side of the country is wrong and one is right. The fact is that when someone votes, they are truly voting for what is right for themselves or their family at that particular moment in their life. So really when we vote we are actually all voting for the same thing and we need to acknowledge this fact. We are all voting for a way to improve our lives. That is the core of each and every person’s decision when they put that cross in the box. The problem is that we are all living different lives! When we vote against a party policy it isn’t because that policy is definitely wrong, it is just wrong for our life at that time. We therefore cannot criticise each other for the way we voted because we can only live our own life. Until we walk in our neighbour’s shoes we can’t judge them for there opinions. All we can do is know that their choice was what was right for them. So all those comments saying “oh well done UK, you’ve ruined the country now,” or “how could you vote that way you idiot” are useless. People don’t vote because they think they are going to save the country or ruin the country, they don’t vote to piss their fellow voters off, they vote for their own tiny network of friends and family and therefore however they voted must be seen as right. Life can change in the blink of an eye. Someone who is doing okay at the moment might suddenly lose their job and have to start claiming benefits. Maybe they voted Blue in the election because it was best for them when they had a good job and were supporting their family, but if they lose their job and need benefits then they might choose to vote Red next time because their circumstances and their priorities have changed. Likewise someone who is struggling in life and really needed the benefits not to be cut might win the lottery (we can all dream!) and then their priorities will change too. Next time they might vote for the party that will give them better interest rates! We don’t know what we are going to need for the rest of our lives so we can only vote for what is right for us at the time. We must be sympathetic and understanding to one another and remember that everyone’s vote was the right choice for them. It might not have been the right one for you, but you aren’t living your friend’s life. We must stop shouting and start supporting each other and our understanding of life will grow and our lives will be richer for it. Rant over, better get on with the novel now! Have a good weekend everyone and I promise the next blog will be light hearted! I love to write but I have never (apart from Facebook and babycentre.com) written publicly! Never in my wildest dreams did I imagine my first ever blog post would be a political one! I’m not what you would call political in any way so my reaction to the impending election has really surprised me. I’ve been thinking (and ranting to my husband and anyone who will listen to me) about this issue for a while. Then one of my old school friends phrased it perfectly the other day on good old Facebook. She is obviously quite politically motivated and said on one of her posts “we’ve got to choose someone or put ourselves in the firing line and get into politics personally.” This really struck a chord with me as I’d been mulling the impending election over in my mind for a long time. As a mum of two young children I rarely have time to think about anything other than what the next meal will be, whether my child will require a snack after school, a midnight nappy change or a security blanket change! However last week, whilst cooking supper for my two year old and five year old daughters I switched Radio 1 on and found myself listening to David Cameron being slaughtered by voters in a Live Lounge session. Throughout the week I managed to catch a couple of the other PM hopefuls who had to face the same onslaught during their Live Lounge question time, and I found myself banging my pots and pans more and more aggressively! I suddenly came to realise that I find it hard to budget for my own tiny family of four every month, let alone a whole nation, so I need to respect anyone who is willing to attempt to take this monumental task on. It seems to me that during an election all common sense is lost. People seem to think that politicians are magicians and can just wave a magic wand and make everything better. As a mum I know that I can’t even do that for my small family, let alone the whole of the UK. Rational adults suddenly dissolve into tantruming two year olds, each with their own agenda with no consideration for anyone else. It is a selfish time and it shows the worst in lots of people. I found myself questioning what this election really meant. For the first time I really listened to what the politicians were saying, what they were trying to achieve and what resources they had to use. The more I listened to their patient voices and then the whinging, whining voices of the voters “I want this, I want that,” I realised that the situation wasn’t much different to my family life. It was just on a much bigger scale. If everyone stopped and looked at the situation in terms of their own small lives, as I’m going to lay it out below, maybe they would see what an impossible task any government is facing. So firstly the thing to remember is that the basic rules of budgeting and keeping people happy apply whether it’s for a family of two, four, sixteen or 64 million people. Me: Prime Minister/ Government/ Chancellor of the Exchequer/ Treasurer! Children: Little Voters with no common sense! We have recently had to re-locate due to my husband’s job which has meant me giving up my job and becoming a full time mum. We therefore have to run the household on one income so budgeting is imperative and I am pretty useless at it! Each month the Tax Payer’s money comes into our account and each month as Prime Minister I’m faced with deciding how best to spend it whilst being moaned at and screamed at from my little voters! The problem is that we all want different things. Of course we do! The little voters would like the latest toys, to go to Legoland, to go to the cinema and to have lots of sweets! The Tax Payer would like to have Sky Sports, Netflix, Sky Movies, a drone, a ski trip and a scuba diving holiday! Generally he goes along with whatever decisions I (The Prime Minister) make, but occasionally he rears his head and decides that as he is the one who ‘pays the tax’ he should have a say in what the money is spent on. This month that happened to be a new BBQ. Man must make fire to feel manly. As Prime Minister of my house I have to try to be the sensible one, although I would like to have my hair cut more than once a year, send the little voters to a better school, eat decent fresh food every week, and go on a nice holiday too! All of these things sound great but obviously it’s not possible to give us all what we want all of the time. It is difficult to say no to the little voters sometimes. I am however what you would call a no nonsense Prime Minister so my voters generally understand when a battle is lost. As I listened to the debate on the radio I could hear in the MP’s & PM’s voices the strain that I hear in my own as I try to explain to my little voters why they can’t have what they are demanding. I could feel the frustration that I feel when they just won’t listen and keep repeating the same demands over and over. Then I felt angry because my voters are only five and two. They don’t know any better at the moment. But we, as real voters, are adults and should know better. These particular voters were behaving like complete spoilt brats. They flatly refused to even acknowledge the answers they were being given and in many cases the MP’s responses were, in my humble opinion, very reasonable. How many times does David Cameron have to repeat “yes I take your point that you think the voting age should be 16, however we have discussed this at length and at the moment we believe it should stay at 18.” What did that particular man expect? That the Prime Minister was just going to say, well yes of course, Bob from Thornton (not the actual name! ), if you think the age should be 16 I will lower it right now! Even I was screaming, ‘just shut up about it’ to the man that just went on and on! It was like being in the supermarket with my youngest little voter. It goes on and on just as it did in the radio debate. The voices of the voters berating the MP’s suddenly became my toddler’s voices, winging and whining about what they wanted and that they wanted it right now. Some wanted more money for the NHS, some for better education, some for better rights for the LGT, some wanted the living wage to be made compulsory and one man in particular was accusing the government of actually causing the dreadful drownings in the Mediterranean, demanding our country does more to help the refugees. It would be ok if they were merely saying politely what they felt was important, then acknowledging the MP’s responses and shutting up, but it was their infuriating persistence that riled me. I don’t deny that all of these causes are important and just. However what people seem to lose sight of during an election is that everyone wants something different and that it is not possible for the Prime Minister (whoever he may be) to give all of his attention to one cause and all of the budget to one agenda no matter how important it is in the eyes of the voters. Just because the government is unable to completely resolve all of the issues exactly the way we voters would like, it does not mean that they have failed as a government. If I can’t afford to take my little voters to Disney Land I feel awful but I haven’t failed as our family Prime Minister. I will take them somewhere fun that we can afford and not put ourselves in more debt. As Prime Minister of two little voters I would say better education and an excellent NHS is probably top of my wish list, and yes this would be at the detriment of the refugees fleeing Syria (sorry if this makes you mad) however I understand that each issue has to be considered and given attention. I’m not going to demand all the attention goes on the things that I want and tell the Prime Minister that he and his government are useless and have let me down just because they have given some attention to someone else’s idea. As I turned in disgust to my fridge to survey my weekly menu I realised that I can barely budget and run a family of four successfully. I get stressed just going to the supermarket, as the food passes through the checkout and the green illuminated figures climb higher and higher always surpassing the money I have allowed for that week my heart rate quickens and I have to calculate what savings I will have to make elsewhere that month. I dread telling the Tax Payer how much of his hard earned money I had to spend on the weekly shop but he understands that budgeting our monthly finances is a fine balancing act. I always start off with good intentions, I tell myself I will only spend £80 on the weekly shop, then bingo we have an impromptu BBQ with friends which costs a small fortune, the car breaks down or the tax disc needs renewing, the girls need a fancy dress costume for world book day, their feet suddenly grow and they require a multitude of new shoes for school, ballet, general day to day playing & wellies, they both get invited to a party where decent presents are required and the money just vanishes. If everyone today really thought about how they run their own finances maybe they wouldn’t be so quick to judge the government who have to sort out the entire nation’s finances. Of course the deficit is a subject that is discussed over and over. People complaining about the cuts that have to be made. Well I’m sure that a lot of people out there have their own deficits to sort out. Credit cards, car finance loans etc. I know we do. Before we had little voters, when I was a tax payer as well and my husband, we took out a loan to start our own business. The business did well but after only a few years we had to close it due to various issues and ridiculous land lords. Although my husband now has a good job we are still tied in to paying back a huge loan probably for the rest of our lives. Each month we see that money going out of our account to cover our past borrowing and we think what we could spend it on instead. However we realised that we took the loan because it was what we wanted at that time in our lives and now we have to pay for it. It means that we have to make certain cutbacks in other areas. We can’t have the best sky package, we can’t send the kids to private school, we can’t go on a super holiday every year, but that’s life. That’s what happens when you borrow more than you can afford, something else has to be cut to pay it back. So the billions of pounds that the last government gave away now has to be recouped by the present government. Cuts have to be made which make the current government look like the bad guys. They aren’t the bad guys they are just trying to get us back on track. Like when some well-meaning family member gives your children all the chocolates and sweets they want over Christmas and you are left looking like the bad guy when you say ‘no more chocolate.’ The look on your children’s faces is awful. They hate you. They don’t understand why they can’t carry on eating chocolate for breakfast, lunch and supper. But they are children. We as a nation should bloody understand why we can’t just be given everything, why cuts have to be made. Whatever government gets in on 7th of May, will have to continue to make cuts in certain areas no matter what promises they are making now. There is no ideal answer, we can’t all have everything as my eldest little voter learned last weekend. Recently we have started giving the little voters some pocket money. Every Sunday they get one shiny gold coin (£1) each to go in their money box. They like to count them every morning at breakfast to make sure they both have the same amount. We then went on a family day out and the eldest little voter decided she would like to buy a cuddly toy to add to her millions of other discarded cuddly toys. We told her she would have to use her own pocket money to buy it. I explained that she had £6 and if she bought the toy she would only have £2 left. At which point the youngest little voter, who was listening and also clutching a cuddly toy, promptly put it back on the shelf and said she wanted to keep all her gold coins instead. The eldest little voter paid her £4 and cuddled her toy all the way home. The next morning at breakfast the girls both opened their money boxes and counted their coins. The youngest one piled her 6 coins up into a tower whereupon the eldest went into a total meltdown crying that it wasn’t fair that her sister had 6 coins and she only had 2 and that they should now share the coins equally between them. I had to sit her down calmly and explain that she had made the decision to spend 4 of her coins which meant she had less than her sister now. She just couldn’t get over the fact that her little sister had more coins than her and that she would probably never have an equal amount again until her sister decided she would like to spend some of her hoard! The frustration I felt explaining the consequences to her was the same as the frustration I felt listening to one of the voters on the radio going on and on that we should be spending more money on helping the refugees coming over from Syria. I’m all for helping people in need but not to the detriment of other important issues. All I could think was that if there came a time when this particular voter had to go to A&E and was made to wait for more than four hours I bet he would be the one to stand up and start shouting that the government should put more funding into the NHS and that they were useless. Blah blah blah. As I had to explain to my daughter, there is a finite amount of money. You cannot put it all into one pot and then complain when there isn’t enough left to go into another pot, which is what a lot of people out there seem to be doing. If it is all put into one pot, then cuts are going to have to be made elsewhere further along the line. It’s not going to be easy and it won’t be fun having to sacrifice things we want but it’s just common sense and it’s what has to happen. There simply isn’t enough money to make every situation perfect. To make every hospital immaculate, to make every school ‘outstanding’, to save all the suffering people around the world. The best anyone can do is try to give everyone a little bit to help their cause and even that is difficult sometimes as we all know from managing our own finances. How many times have you wanted to give someone a better birthday present, to really spoil someone who deserves it, but in the end you just can’t afford it. So you give your family your love and your support and your ear. You listen to your children’s wants and demands and sometimes you can treat them and other times you have to try to placate them with something else. That’s life. 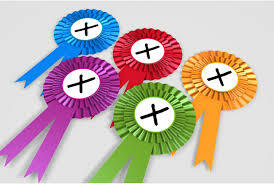 So before you vote on 7th May, really think about what’s important to you, look at all of the party’s agendas and realise that no one will be able to fulfill all of your criteria so you have to go for the most sensible overall package that suits your needs. Don’t criticise our current Prime Minister for making the cuts that have been necessary because the last Prime Minister borrowed too much, and before you criticise the next Prime Minister (whoever that may be), for not giving all his attention to your particular cause; STOP. Think about how hard it is to run a normal family budget. Think about the unexpected costs that arise each month that you haven’t budgeted for, where does the money come from to cover those extra costs? How does your stomach churn and your mind buzz trying to make cuts elsewhere to make sure you don’t run out of money by the end of the month? Now be grateful that there are people in this country who actually want to give looking after our entire nation a bash, because it’s not a job I would want to do.